Rabbi Emily Losben-Ostrov is honored to serve as the spiritual leader of Temple of Israel. Prior to her arrival, she served as Rabbi of Anshe Hesed in Erie, PA for three years. Before that she served as the Rabbi of Sinai Reform Temple in Bay Shore, New York (Long Island) for seven years following her ordination from Hebrew Union College-Jewish Institute of Religion in Cincinnati in 2008. 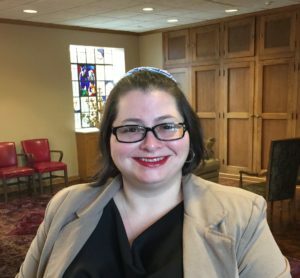 Rabbi Losben-Ostrov originally hails from Bucks County (the suburbs of Philadelphia), and is blessed to often lead services with her husband, Ruben Ostrov who volunteers his beautiful voice in prayer. While at HUC-JIR, she wrote her Rabbinic Thesis on, “Naming the Unnamed: Biblical Characters Known only by their Roles or Relationships.” Rabbi Losben-Ostrov graduated from Albright College (Reading, PA) where she was in the Honors Program and received a BA in French and another BA in Political Science and Communications. She also has a Master’s Degree in “Educational Administration” from Xavier University and a Master’s Degree from HUC-JIR in “Hebrew Letters.” Rabbi Losben-Ostrov is very proud to have founded the Pesach Project for HUC-JIR which has now allowed hundreds of Rabbinical Students to help lead seders and educational opportunities in the Former Soviet Union. She is also very passionate about fighting AIDS and has led an annual Healing Service for nearly two decades to raise awareness of the AIDS crisis. Rabbi Losben-Ostrov also served small Jewish communities as a “Student Rabbi” in Joplin, MO; Bowling Green, KY; Bloomsburg, PA; Pine Bluff and McGehee, AR; and La Salle, IL. She has also spent time working with Jewish youth in Reading, PA; Larchmont, NY; at Camp Harlam and as the Advisor to the NFTY-Missouri Valley Region. Additionally, Rabbi Losben-Ostrov loves to teach about Judaism and taught a weekly “Introduction to Judaism Class” for the Reform Movement in New York City. She and her husband, Ruben Ostrov, founded the company, “Meshuga Bands” which creates fun and whimsical Jewish products for all age groups. Rabbi Losben-Ostrov also loves spending time with her family, going to the theater, traveling, skiing, playing tennis and just hanging out with her husband and their dog, George. You can contact her at: rabbilosben@gmail.com or by calling the Temple at 910-762-0000.